Over the same old masala dosa? M Dosa Express in Karol Bagh has a surprise for you. Well, 131 of them. That’s the number of dosas they have on their menu! 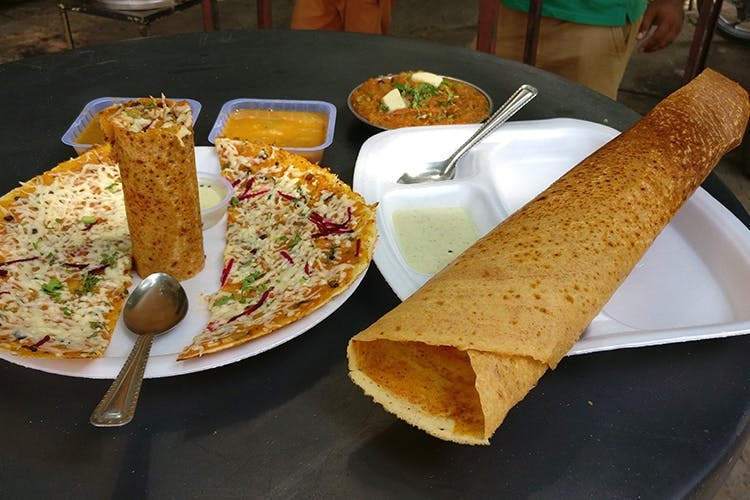 M Dosa Express, located on Tank Road, Karol Bagh, is a small eatery where dosa knights stand guard. You could stand there, watch that dosa batter go round and round all day and not be bored for a second. You could go for a Cheese Dosa, a Mushroom Dosa, or a Spring Roll Dosa (or choose from the remaining 127) depending on your mood and palate. You don’t even need to head over anywhere else for dessert, just order their Chocolate Dosa (mixed feelings about this). We tried the Golmaal Dosa and the Pav Bhaji Dosa and we’ve got to say they were absolutely delicious. They have somehow managed to maintain the authenticity of the dosa while whipping up these crazy fusions. Their location is somewhat inconvenient—a bit hard to find and unlike many roadside dhabas, you can't just park and enjoy a meal sitting in your car. Parking space is scarce in that area, so make sure you choose a mode of transport that isn’t much of a parking hassle.